Water from a field has surrounded bins and flows over a road just north of Tuscola, Ill., along US 45 on May 4, 2017. Over the past few decades, the U.S. agriculture industry has been able to produce more crops despite increases in droughts, floods and other climate-related issues thanks to advances in technology. But the effectiveness of changing agricultural methods is unlikely to keep up as the planet continues to warm, according to a new federal climate report released Friday. “It’s not clear how far that progress can keep going,” said Don Wuebbles, a professor at the University of Illinois and one of the authors of the Fourth National Climate Assessment. Climate change will have a major impact on agriculture, and warming temperatures are likely to disrupt global trade, exacerbate water issues, harm rural communities and decrease livestock and crop productivity, according to the report. Overall, the Fourth National Climate Assessment, compiled by more than 300 scientists across the federal government, found that the "Earth's climate is now changing faster than at any point in the history of modern civilization, primarily as a result of human activities." The average annual temperature in the contiguous United States has increased 1.8°F since the beginning of the 20th century. In the last few decades, the agriculture industry has introduced new genetically engineered seeds to withstand drought and pests. Farmers overall have had to adapt their crops to the changing climate by adjusting when they plant crops or how they control pests and diseases in the fields. 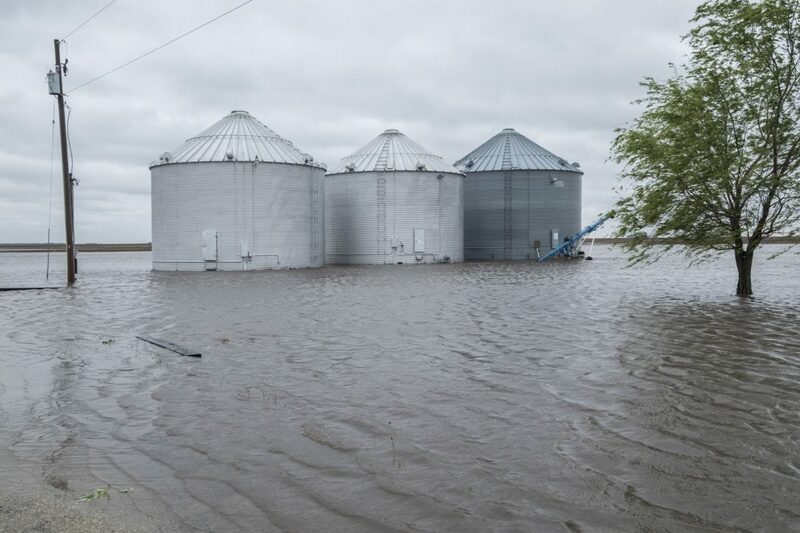 So far, too much water has been one of the largest threats to crop production in Illinois, one of the biggest corn and soybean producing states, Angel said. In recent years, extreme rain has caused flooding in fields and increased runoff. But in the future, Angel said that high temperatures will be the larger threat to crop production as heat is one of the major stressors on corn. Agriculture- and food-related sectors contribute almost $1 trillion (about 5.5 percent of total GDP) to the U.S. economy, including 24 million jobs, making up 12.5 percent of all U.S. employment, according to the assessment. Continuous advancements will be needed to help the U.S. agriculture industry adapt to the changes, the report said. Wuebbles, who served as lead climate scientist in the Obama administration, found there could be as much as a 50 percent reduction in corn production by mid-century. The assessment found that over the next three decades, crop yields are projected to decline to the levels of the 1980s because of an increase in temperatures, extreme rain events and incidents of drought. Nationwide, in 1984, corn yields averaged 106 bushels an acre. In 2017, corn yields average 176 bushels an acre, according to data from the USDA. This will especially hit the Midwest as corn and soybeans make up 75 percent of crops grown. The impacts are expected to cause human health issues and overall decreases in the U.S. economy by the end of the century. The overall changes are impossible to project, largely because it depends on how much action is taken to curb greenhouse gas emissions. The assessment found that, as the globe warms, everything from where crops are grown and how much water is available for irrigation to environmental stress on livestock and the complex international trade system will shift. Genetically engineered crops have driven the increases in crop productivity over the past few decades, the report said. However, the private sector likely won’t be able to even keep yields where they are today without public help, the report said. The federal government will likely need to invest in genetic engineering and help potential progress navigate issues like intellectual property rights and limitations to access of genetic resources, the report said. “Investments by commercial firms alone are unlikely to be sufficient to maintain (genetic) resources, meaning higher levels of public investment would be needed for genetic resource conservation, characterization, and use,” the report said. The report also expressed a need for genetic engineering for crops outside of major commodity crops, like corn and soybeans. Angel said the Corn Belt is currently shifting and southern parts of Illinois and Missouri are already getting too warm to effectively grow corn. Already, many countries are experiencing rapid price increases for food because of unpredictable weather and more frequent weather extremes, the report said. Across the globe, the uncertainties created by changing temperature and precipitation will alter food prices, trade markets and production and consumption patterns, the report said. Whether growers can adapt will determine the extent of those uncertainties. “Risks associated with climate changes depend on the rate and severity of the changes and the ability of producers to adapt to changes,” the report said. The report found that food security will likely become an even greater challenge as the climate changes and global populations increase to 9.8 billion by 2050. “The United States is a major exporter of agricultural commodities, and a disruption in its agricultural production will affect the agricultural sector on a global scale,” the report said. The report said that disruptions to trade, through extreme weather events, might also impact the U.S. agriculture industry. “In addition to local impacts on U.S.-owned assets abroad, climate change is expected to lead to large-scale shifts in the availability and prices of many agricultural products across the world, with corresponding impacts on U.S. agricultural producers and the U.S. economy,” the report said. This will likely have an outsized effect on rural communities. “Rural communities, where economies are more tightly interconnected with agriculture than with other sectors, are particularly vulnerable to the agricultural volatility related to climate,” the report said. This includes migrant workers, who often work outside and will face more stress due to higher temperatures. “Migrant workers, who provide much of the agricultural labor in some regions and some enterprises, are particularly vulnerable (to human health concerns),” the report said. Angel said that he is especially concerned about migrant workers, as they work outside but also live in housing that often isn’t air-conditioned. Those concerns extend to other agricultural workers, he said. “Air quality might be as much of a problem in rural communities as urban areas,” he said. Climate change is also likely to affect livestock and poultry, which together account for over half of U.S. agricultural cash receipts. “Projected increases in daily maximum temperatures and heat waves will lead to further heat stress for livestock, although the severity of consequences will vary by region,” the report said. The issues that livestock face include degraded pasture and range areas, but also effects to the animals, including reducing reproductive efficiency, the report said. “Temperatures beyond the optimal range alter the physiological functions of animals, resulting in changes in respiration rate, heart rate, blood chemistry, hormones, and metabolism; such temperatures generally result in behavioral changes as well, such as increased intake of water and reduced feed intake,” the report said. Changing precipitation trends will likely lead to an array of issues, including an increase in irrigation in some areas, an inability to irrigate because of water shortage issues, soil degradation and water quality issues, the report said. The impact depends on where farmers are. Increasing precipitation will likely lead to more runoff, harming soil and leading to more eutrophication, or nutrient overloads, due to fertilizers being washed away, the report said. That will likely lead to water quality issues for water treatment plants, but also to more hypoxia, or dead zones, like that in the Gulf of Mexico. Angel said that already the Midwest is seeing issues with runoff and nitrates, and that will only increase. “Especially with the increase in heavy rain events,” Angel said. Overall, from 1960 to 2008, the incidences of hypoxia in the United States increased by a factor of 30, the report said. “Projections for hypoxia indicate a worsening trend, with increased frequency, intensity, and duration of hypoxic episodes,” the report said. The Ogallala Aquifer, which makes up parts of Texas, Oklahoma, Kansas, Nebraska and Colorado, is already seeing unsustainable levels of groundwater depletion because of agricultural irrigation. Current levels of extraction are already too high, and more water will be needed as drought increases, the report said. Increasingly, the area has seen dust storms like those of the 1930s Dust Bowl. Some progress has been made, but climate change will increase the stress on the aquifer. “Recent advances in precision irrigation technologies, improved understanding of the impacts of different dryland and irrigation management strategies on crop productivity, and the adoption of weather-based irrigation scheduling tools as well as drought-tolerant crop varieties have increased the ability to cope with projected heat stress and drought conditions under climate change,” the report said. Angel said he expects irrigation to increase in parts of Illinois, though it only exists in areas with high-value crops like seed corns now. He said increasing irrigation comes with its own issues, including energy cost and affects on water supplies.